Studytech specialises in Voice over IP (VoIP) telephone systems with the full range of features you’d expect from any enterprise-grade phone system. Incoming calls can be directed to any any department or single handset within your organisation based on an intuitive menu system. Based on your requirements, we’ll build up a menu that’s easy for your customers to navigate, so they can quickly speak to the right person. For your own peace of mind, our system can record your calls and archive them, be that for “quality and coaching purposes” or accountability and legal protection. Each extension on your system can be equipped with a voice mailbox. Voice messages can be retrieved from a handset, or they can be emailed, so your staff can retrieve their messages even when they’re away from their desks. Because our phone system runs on your existing local area network, handsets can easily be moved from one desk to another without complex patching or reprogramming. 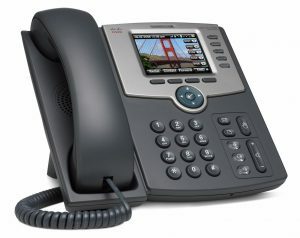 In fact, we can configure handsets to work from home, interstate or even overseas via the internet. Because we can set up extensions anywhere where there’s internet access, getting remote staff connected is a breeze. Desk phones can be configured to work from practically anywhere, and mobile apps allow your staff to place and answer office calls from their mobile device, as though they were sitting at their desk. If your business has branch offices interstate or overseas, we can extend your phone system into those offices, allowing staff to communicate around the world, just by entering an extension number. Calls to branch-office numbers will ring on branch-office extensions, and can be transferred to any phone, at any office around the world. After hours enquiries in one time zone can be redirected to a branch in another, so you never miss a call. We can do all this off a single phone system, or for larger installations we can set up a VoIP system at each site and link them together. Studytech’s VoIP phone systems are designed save you money through lower setup costs and lower running costs. By purchasing the phone equipment outright, you won’t be locked into a costly and restrictive rental contract. Our ongoing support and maintenance fees are very competitive, and our service is prompt and efficient. Because calls to branch offices and mobile users are effectively internal calls, you’ll save money communicating with your own staff. Our VoIP systems can utilise old-school PSTN phone lines from any carrier (including Telstra, Optus, AAPT etc), or we can move your existing numbers to an Internet Telephony Service Provider (ITSP) for greater flexibility at a reduced cost. You’ll instantly save money on line rental, and your call costs are typically lower as well. As your business grows, you don’t need to add existing phone lines to your site – just add another virtual line to your VoIP system. Call us from your old phone system, and we’ll tell you how much better it could be.